Apple, a company known for its high level of innovation in electronics design and manufacturing is playing key role in semiconductor chip market. Some of its smart semiconductor choices/options causing significant impact on the overall chip market. Apple is the world's largest fabless chip design company, among those which use the chips only for internal use. Apple uses semiconductor IP from companies such as ARM and designs its own complex SoCs for its iPhones and iPads. Apple was highly relying on Samsung's chip fab to get its ICs manufactured. To save itself from the risk of one vendor, There are reports of Apple placing big order of chips-manufacturing to TSMC for use in its new range of iPhones and other portable devices. TSMC which is having a good list of super customers for its advanced fab including Apple, is going to increase its share in pure-play foundry business. The other pure play foundry businesses are also expected to grow better than the semiconductor industry average in 2013. By observing all this, IHS has forecasted pure-play semiconductor foundry market revenue is forecasted to rise by 21 percent compared to 2012 by the end of 2013. This level of growth is not going to be seen in the overall semiconductor market, as per IHS. IHS estimates the overall semiconductor industry will expand by a more staid 5 percent. 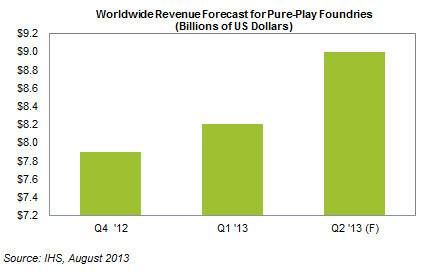 The pure-play foundry industry is estimated to generate a revenue of $8.2 billion in the first quarter, up 4 percent from $7.9 billion in the fourth quarter last year, as shown in the attached figure. In comparison, the overall semiconductor market was down by 5 percent during the same period. “However, Apple’s anticipated shift is also the result of its well-publicized tiffs with Samsung over patent infringements on both makers’ smartphones that have strained relationships between the two,” Jelinek added. Although strong growth is projected in 2013 for foundry suppliers, several concerns abound that foundry players must monitor throughout the year. Foundry suppliers must be aware of the global economy, as well as the inventory that their clients maintain. Should the world market sputter, consumer demand for electronic products will weaken, thereby impacting chip makers and foundries alike. If inventory grows out of control for foundry clients as it did in the second half of 2012, manufacturing run rates for foundries could decline significantly for the remaining six months of 2013 as their customers hold back on chip orders. A rising threat to foundries is also coming from IDMs like Samsung and chipmaker Intel. For the first time, the top foundry suppliers are facing technological competition from IDMs—which means that the leading foundries are no longer in competition with just one another. As several IDMs attempt to revamp their manufacturing models and move to new and more efficient lithographies, incumbent foundries will be forced to accelerate internal technology development. The race between the two rival groups will result in a shortening of technology cycles and fierce competition among participants. A company unsuccessful in execution will inevitably lose important market share and be weakened, or worse, forced out, IHS believes. Ultimately the consumer will be the winner. Technological developments will provide designers the ability to integrate multiple functions onto a chip, offered at a unit cost that results in cheaper, yet more powerful consumer products.